All of us at one time or another have been on the proverbial precipice, scared and unsure if we could do something. How do people conquer fear and meet a milestone or break through a boundary? Often it starts with trust. Trusting yourself, family, friends and co-workers that they will support and help you. When faced with a challenge and doubt or fear, our guides ask participants to break the problem down into smaller pieces. First we establish an initial goal. It could be to get the top of the ladder on the zip line or complete level I on our three-level high ropes challenge course. Then we might encourage them to take an additional step once the interim goal is reached. Each step helps get the person closer and often makes a formerly daunting challenge easier to achieve. Trying new things is exciting and comfortable for many. Using something that we are familiar with makes it easier to incrementally try new things. We often ask people to talk about themselves and put them in a comfort zone as we help them try something new to move to their growth zone. We get people to say yes and try something and this success helps build additional success of taking on a new challenge. The feeling of conquering your fear is powerful as you get a sense of relief and accomplishment. Sharing in your success with your family, friends or co-workers reinforces the moment and makes it special. 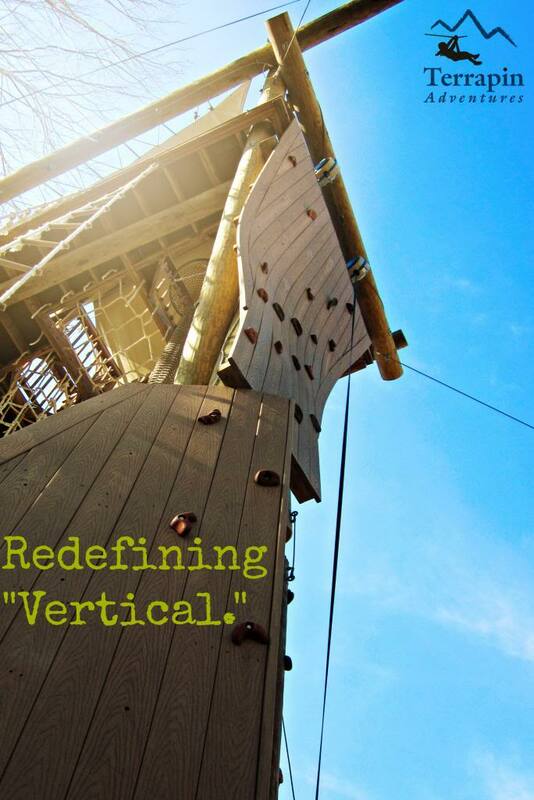 At Terrapin Adventures we have created a new realm of aerial adventures with only wood, rope and cable. We’ve combined team building and thrills within the context of caring for and understanding our environment. It’s exploring, learning about, and enjoying nature as it was meant to be. If you have any questions about How to Conquer Fear, please call Terrapin Adventures at 301.725.1313, email us at info@terrapinadventures.com, or fill out the contact form on our website. You can also follow Terrapin Adventures us on Facebook, Twitter, LinkedIn, YouTube, Google+, and Pinterest for up-to-date information on events, trends, and other fun and exciting outdoor activities. This entry was posted on Monday, June 7th, 2010 at 6:24 pm. Both comments and pings are currently closed.